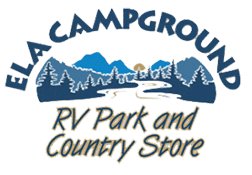 THE PROPERTY OWNER OF ELA CAMPGROUND MAKES NO REFUNDS FOR NO SHOWS OR EARLY CHECK OUTS! The minimum stay is 2 nights. Holiday weekends have a 3-night minimum stay, entire amount of stay is due at time of books, and there is no refund for cancellation. Confirm holiday dates when booking. Discounts are not valid for holiday periods. No two discounts can be used together Rates are based on up to four persons per site or cabin. A site rate is not guaranteed unless booked and paid for. NO REFUNDS FOR HOLIDAY RESERVATIONS. Subject to availability, not for holidays, cannot be used with any other discount and may be withdrawn or changed at any time. The full amount of your reservation is paid at time of booking. Campsite cancellations more than 48 hours from date of arrival will receive 100% refund less a $25.00 processing fee. Cancellations within 24-48 hours receive a 50% refund less a $25 processing fee. There is no refund for a less than 24 hour notice or a no show. Camping Cabins and Rental Trailers canceled 2 weeks or longer prior to the date of arrival receive a 75% refund. Less than one to two weeks prior notice is a 50% refund. There is no refund for a less than a week prior notice or a no show. No refunds due to weather or natural occurrences. We accept Visa, MasterCard, Discover, personal checks, cash and traveler’s checks. Only one vehicle per site. Individual campfires must be above ground and contained. No washing pets, dishes, pots, pans, laundry etc. in the bathhouse sinks. Use the sink outside Bathhouse 1. Non-aggressive, well-behaved pets 20 lbs. and under are welcome. Please do not leave them unattended and pick and dispose of their waste. No animals in the bathhouses or pool area. There is a non-refundable $25 pet fee for pets in cabins. Pets are not allowed in rental RV trailers.